Google’s pitch to campaigns: Be on phones, tablets and laptops. Joe Crisco’s name was on a campaign billboard in his hometown of Woodbridge. His lawn signs dotted the seven towns in his state Senate district to the west and north of New Haven. His flyers arrived in the mail, same as in every other race the Democrat has run since 1992. You just couldn’t find him on your iPad or smartphone. But if your zip code or some other identifier linked you to the 17th Senate District, you probably saw an ad for his Republican challenger, George Logan, when you looked at Facebook or checked the scores online at CBS Sports, the forecast at AccuWeather.com or political stories at the Huffington Post or the Conservative Tribune. Crisco, 80, the winner of 12 previous campaigns, says he deferred to the playbook offered by his campaign consultant, DNA Campaigns, and didn’t spend a dime advertising on Facebook, Google or other digital media. Logan, 47, an inexperienced opponent and a recent enrollee in the GOP, spent $14,446 of a $105,000 budget on ads that followed local voters around the web. The Crisco-Logan race was emblematic of a widening strategic divide in Connecticut that’s likely to loom large as the parties perform their election postmortems on 2016 and look ahead to 2018: Republican candidates dramatically outspent Democrats on web advertising in 2016 as they gained eight seats in the House and three in the Senate — including Logan snatching Crisco’s seat in a district that favors Democrats. A CT Mirror analysis of all 36 state Senate races found Republican candidates spent 12 times more on digital advertising than Democrats, about $230,000 to $20,400 through Nov. 1, the most recent data available. Final spending reports on the Nov. 8 election are not due until year’s end. With House and Senate races combined, the disparity was about 6-1. The 2016 election, of course, offers much to analyze beyond technology, and digital ads were no guarantee of success. Republican Lorraine Marchetti spent more than $15,000 on web ads in the 4th Senate District, but fell short of unseating Sen. Steve Cassano, D-Manchester, a DNA client who spent just $500 online. And the biggest digital spender was another runner up, Republican Gregory Ehlers, who spent nearly $46,000 on digital advertising while losing to Senate Majority Leader Bob Duff, D-Norwalk. But in a year when targeted digital ads seemed to come of age in U.S. political campaigns, the Democrats’ reluctance to follow Republicans, independent expenditure groups and commercial marketers onto the internet was striking. One factor is that two of the biggest Democratic consultants, The Vinci Group and DNA Campaigns, specialize in direct mail and have little experience in digital. 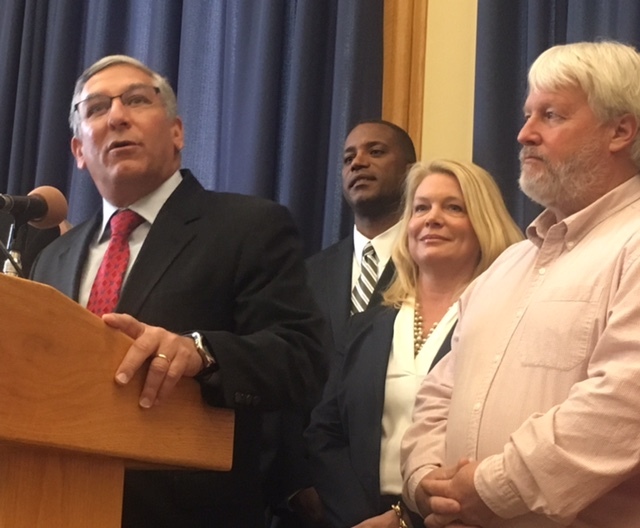 Sen. Len Fasano with his new caucus members: George Logan, Heather Somers and Craig Miner. GOP Senate candidates outspent Democrats on the web, 12-1. Democrats, who are analyzing their losses in terms of everything from voter discontent over the state’s fragile finances to the unpopularity of Gov. Dannel P. Malloy and the impact of Donald J. Trump’s strength in selected districts, are not convinced by the new metrics of the web or comfortable with the myriad new ways of reaching and tracking customers online. “From my perspective, I’m not completely sold that is a major factor in swinging elections,” said Patrick Romano of DNA Campaigns. He conceded, however, that his post-election feedback was that Logan’s web ads were widely seen and well-received. When a political action committee controlled by the House Democratic leadership did decide to do some digital ads, it went out of state, paying $17,000 to Becker Digital Strategies of Washington, D.C.
On average, Republican candidates for the state Senate spent $8,250 on web advertising to $638 for Democrats. Only four Democrats reported spending more than $1,000 on digital, none more than $5,000. The matchup In Danbury between state Sen. Michael McLachlan, a Republican, and Democrat Kenneth Gucker was typical. McLachlan spent $10,250 on web advertising, while the $329 that Gucker spent on helium balloons was more than his web ad budget of $300. In the race for an open seat in the 30th Senate District, Republican Craig Miner of Litchfield spent $10,500 online. The loser, Democrat David Lawson of New Milford, spent a few hundred dollars on a web presence – about the same as he did on campaign buttons and pens. Campaign spending always has been idiosyncratic, often relying on candidates’ taste or sense of what works in their districts. Duff, whose constituents spend significant portions of their day in traffic on I-95, spent at least $26,000 on billboards. He likes to kick off his campaigns with a family-oriented ice cream social, as reflected in his reports. His campaign paid $500 to Mr. Frosty for ice cream, $200 to a clown and $200 for face-painting in August. He declined to discuss strategy for him or his caucus. Maria Miranda of Miranda Creative, who advised Logan, Ehlers and other Republicans who embraced digital advertising, said both parties have plenty of candidates reluctant to integrate digital advertising into their campaigns for General Assembly. Overall, Republican candidates for the General Assembly appeared to outspend Democrats online, $280,000 to $45,000, though the failure of many campaigns to adequately disclose details of their expenditures to the State Elections Enforcement Commission makes a precise accounting impossible. Candidates reported spending $231,072 on web ads to the commission’s digital reporting system, which is designed to allow users to quickly sort and analyze spending by categories, such as web ads, direct mail and polling. A review of individual candidate reports, which sometimes had additional descriptions of spending, found that miscoding kept about $100,000 from that total. The Senate campaign of Republican Heather Somers, for example, coded nearly all her expenses as “miscellaneous,” so none of her spending appears in a download of candidate spending by category. But her reports provide enough descriptive detail to show her miscellaneous spending included $5,783.24 for “advertising in electronic media” and $67,887.67 for direct mail. Another obstacle to transparency is the practice of many campaigns to funnel their spending through consultants, who then purchase goods and services, not always disclosing details. A typical example is Duff’s campaign listing of a $10,838.83 payment in July to his consultant, The Sono Group, for “Web, advertising, DJ.” Where was the advertising? What was the web expenditure? What did the disc jockey cost? It’s impossible to know from the report, and Duff could not provide the details. Whatever the precise numbers, a picture emerges from the data and from interviews with candidates and consultants. If the web, which allows sellers to target consumers based on geography, interests and demographics, is the future of marketing, the Grand Old Party has a distinct advantage going into 2018. It has a coterie of candidates and campaign consultants who have, at the very least, explored the possibilities of a new medium. And digital marketers warn there is much to learn. “The way digital buying works can be complex,” Miranda said. She hired TargetonStar, a commercial marketing firm in Milford, to place and, equally importantly, track her clients’ ads. From Facebook’s pitch to campaigns. Bill Ross, the president of TargetonStar, which has worked for the campaigns of a half-dozen Republicans and one Democrat, said candidates need to know what they are buying in a fast-changing marketplace and how to make sense of the metrics that measure results. Some web ads are visible to every visitor to the same web site, much like display advertising in a newspaper. But others are geared to individual readers, using the data that is linked to individuals and their computers whenever they are on the web. In Logan’s campaign, older white males from some of the district’s more conservative towns might have been the only voters to have a certain Logan ad about taxes pop up while reading the Conservative Tribune or Huffington Post or checking AccuWeather, all sites where the campaign’s ads appeared. Logan’s campaign paid $10,000 to TargetonStar for ads targeted at readers who fit certain criteria. 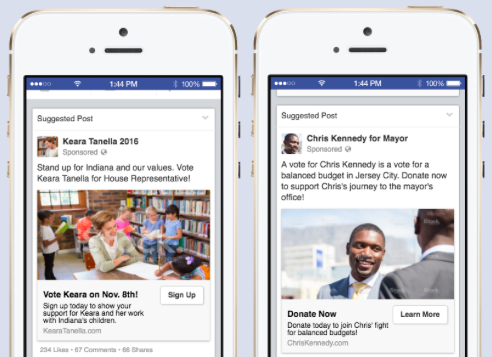 Another $4,446 bought ads that appeared in the Facebook news feeds of voters in the district. Those ads could be shared, expanding their reach. They also invited readers to click through to Logan’s web site, as did the ads placed by TargetonStar. Miranda said the campaigns could monitor the web ads and make adjustments, such as Logan’s shift away from Spotify, the online music service, when his ads there generated little activiity. Logan credited his consultants and his own lack of preconceived notions about how to wage a campaign for his investments in digital ads. 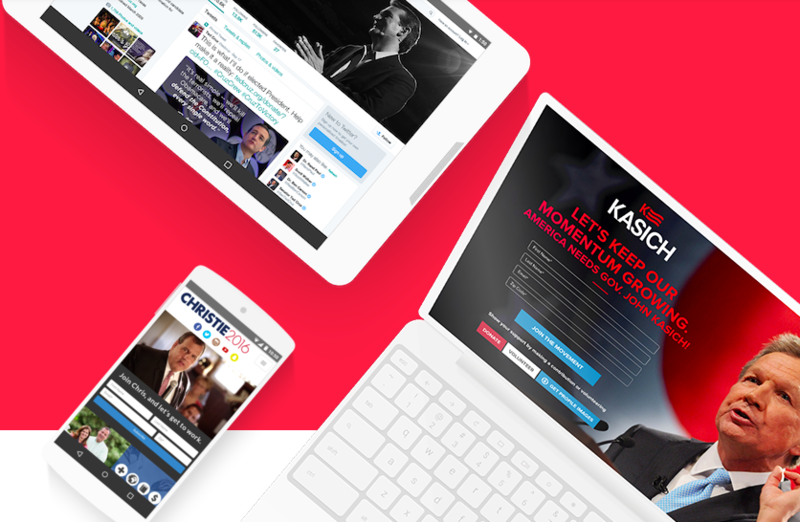 The ephemeral nature of web ads — they exist for a moment in time, visible to some and invisible to others — require an element of faith from candidates that the ads exist and are reaching voters. A digital ad in a statewide race might target women aged 40 to 45 in Fairfield County. In a legislative contest, it might be addressed to gun owners, parents of school-aged children or Planned Parenthood members living in specific towns. About half of its $328,000 budget went to digital ads placed by IMGE, mostly punchy 15-second videos that tagged targeted Democrats as “rubber stamps” for Malloy, closing with a brief plug for their Republican opponents. The Connecticut Business and Industry Association spent $110,000 of its $481,000 independent-expenditure campaign on digital, primarily in support of Republicans. The two groups overlapped in two Senate races, each backing Logan over Crisco and Somers over Democrat Tim Bowles in the contest for an open seat held by the retiring Sen. Andrew Maynard, D-Stonington. CBIA ran ads supporting Republican Len Suzio in his challenge of Sen. Dante Bartolomeo, D-Meriden. Logan, Somers and Suzio won. CBIA went three for four in Senate races, failing only to unseat Sen. Mae Flexer, D-Killingly. Grow Connecticut went two for three, failing only to defeat Cassano. “I think this is a great case study for Connecticut Republicans to pay attention to,” Musser said. Miranda warned that any advantage derived from studying 2016 could be fleeting. Tomorrow’s voters, she said, will be some of the kids who check Instagram 16 times an hour today, spending a few brief moments looking at images that either grab or bore them. Campaigns will need to find a way to reach them.